When crafting menus, restaurants have a lot to consider, like the progression of flavors and textures throughout the meal or which wine complements each course. But there’s a new dimension chefs and restaurateurs are starting to add to the equation: Which song pairs best with the food? 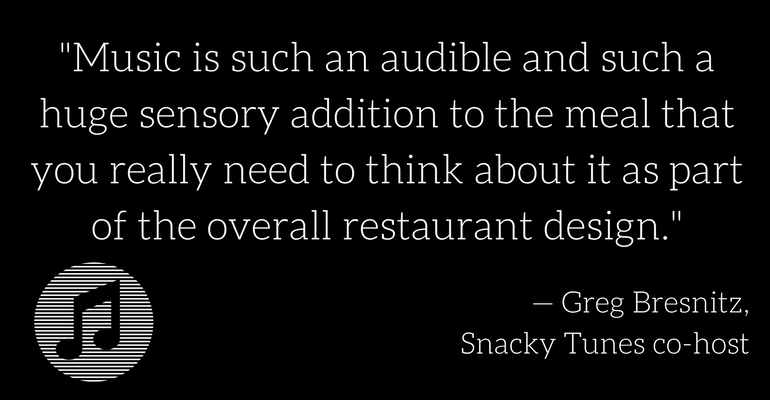 For some, this might seem like an unnecessary concern, but according to Darin and Greg Bresnitz, co-founders and co-hosts of food-and-music podcast series Snacky Tunes, it would be irresponsible not to think about your restaurant’s playlist. The concept of this interplay between food and music is something the twin brothers have a long history of exploring. In 2001, Darin Bresnitz, who had gone to school for television production, fell in love with food television shows such as “Iron Chef” and Jamie Oliver’s “The Naked Chef.” The exposure to culinary-focused programming led him to intern at New England-based restaurant review television show “Phantom Gourmet,” and then later create and co-produce “Dinner with the Band,” with Greg Bresnitz in 2007 as a web series, which later ran on IFC in 2009. The duo, former DJs who have toured internationally, also co-founded Finger on the Pulse, a Brooklyn, N.Y., events and production venture behind the summer food-and-music festival series, BBQ Blowout. It was during the lead-up to launching “Dinner with the Band” that the brothers decided to expand into online radio with Snacky Tunes. The live podcast officially kicked off in 2009 under Heritage Radio Network out of Roberta’s Pizza in Brooklyn. 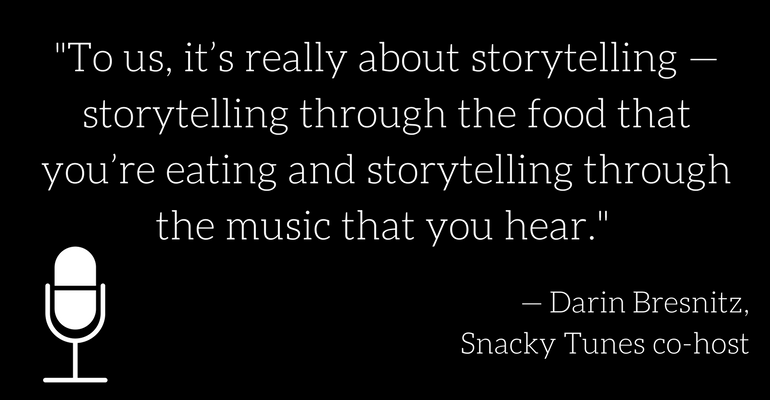 Each episode of Snacky Tunes, which airs on Sundays at 4:30 p.m. EST, features a chef or someone within the restaurant industry, as well as a live in-studio performance from up-and-coming musicians. This culinary and musical blend works because of the increased attention food has received in recent years and the similarities between chefs and musicians, according to the brothers. Since its inception, Snacky Tunes has featured chefs like Massimo Bottura, Wolfgang Puck, Niki Nakayama, Curtis Stone and Nyesha Arrington. The podcast has a weekly listenership of around 10,000 people, made up of foodies and music lovers of all ages and backgrounds. The brothers have gone through life changes since the beginning of the show. Darin Bresnitz now lives in Los Angeles and is creative development director of Tastemade, and will soon welcome his first child, daughter Josephine, with his wife. Greg Bresnitz, still based in Brooklyn, is head of business development for the Ace Hotel. But the pair are still as committed to Snacky Tunes as ever and have continued to expand the show in new ways. One development is Chef Music Monday, a weekly installment of chef-curated music playlists that started last year. The first playlist came from chef Marc Vetri, a big supporter of Snacky Tunes, who also plays guitar with musician friend Phil Roy. Now into its second season, Chef Music Monday showcases its featured chefs in a new light, bringing out their personalities in a way that you might not experience through their cooking. Some chefs create a playlist based on songs of personal significance, such as Edouardo Jordan of JuneBaby in Seattle, who shared music his father taught him and what he listened to growing up. Others, like Ariel Arce of Air’s Champagne Parlor in New York City, feature songs you might hear while dining out at their concepts. In addition to Chef Music Monday, Snacky Tunes is also starting to host live events. Darin and Greg Bresnitz, along with co-producer Khuong Phan, are partnering with entertainment presenter Goldenvoice to hold the first live Snacky Tunes show at the El Rey Theatre in Los Angeles on March 13. Tickets are $30 and will include a meal inspired by the performance, weaving live music and food together just like a Snacky Tunes episode would. This has been updated to clarify Darin Bresnitz’s role in "Dinner with the Band" and Greg Bresnitz’s current work title.